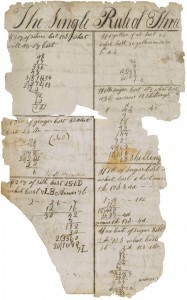 April 22, 2010 — Using digital images, scholars have discovered that fragments of paper at libraries at Brown and the University of Chicago are two halves of a single page on which the teenaged Abraham Lincoln copied out math problems. It’s one of the earliest examples of Lincoln’s thought and writing. For nearly a century the two halves have been stored 1,000 miles apart in Brown’s John Hay Library and at the University of Chicago. This spring Daniel Stowell, editor of the Papers of Abraham Lincoln, a project of the Lincoln Presidential Library and Museum in Springfield, Illinois, finally connected them together. Since 2006, Stowell and his colleagues have been criss crossing the United States scanning Lincoln documents—more than 57,000 so far. Because Brown has one of the largest Lincoln collections, they scanned 1,117 documents at the Hay, Stowell says. 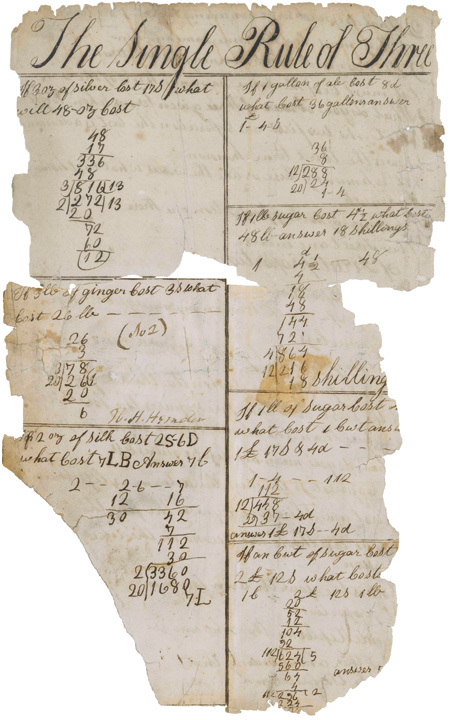 While cataloguing the digitized images, Stowell noticed that both Brown and Chicago owned fragments of pages on which Lincoln had written math problems, and when Stowell matched the two scans he found that they lined up exactly along the tear. The top half of the numeral 18 was on the Brown half, and the lower half was on the Chicago scrap. He also found that on the back of the fragments the abbreviation £ was bisected perfectly.